Silver Samurai and the hand face off with the new avengers. Cap and Harada talk things out while one of Haradas saviors demands he take action. Cap does not want a fight especially after Harada reveals he was abducted and imprisoned wrongfully. Harada kills his “handlers” while Iron man dispatches the hand. Cage knocks Harada down until cap calms him and Harada finishes telling them how he was abducted from his private jet and placed in a prison. He never knew where he was until the prison break and then he was whisked back to japan by the hand and their hydra and them wanted him to take a stand against his attackers. Jessica take Viper with her after Harada warns cap that he will go to the press with what happened. The whole exchange put cap on edge. On the jet back to , everyone except cap falls asleep and Viper signals to Jessica to release a hatch so she can escape. Jess does this but right as the hatch flies open cap decides to check on something and is himself cast out of the ship. Jessica panicking goes to his rescue managing to save him. She laments how sorry she was and that she has no idea what happened. Ronin is not convinced and cap picks up on this. Back in America Ronin reveals his identity…..as Maya Lopez aka Echo. 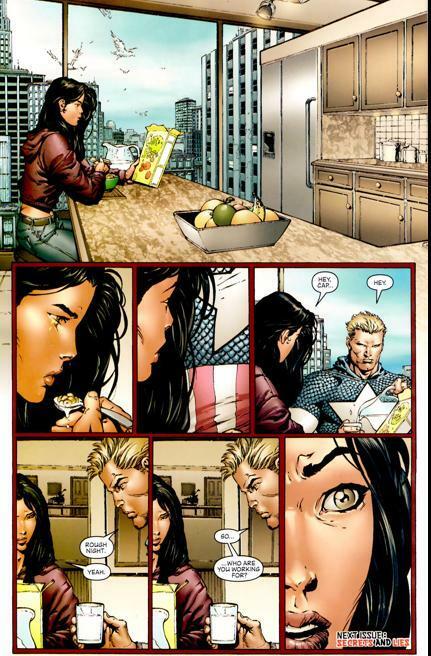 That same morning cap confronts Jessica on who she is working for and where he loyalties lay. Well paced issue filled with all kinds of nods to fans. I remember when this issue hit message boards across the web where like WTF? WHO IS ? (ha ha) even I did the same. It was a masterfully done reveal that was so obvious looking back but still so unexpected it didn’t feel cheap. Also of not is the continued conspiracy theories being thrown around. In this issue we get a hand/hydra alliance that Viper wants but the entire lead up to it screams conspiracy. Let me elaborate: Harada is on a private jet home, he gets tossed in prison and he is officially declared dead by shield. Someone orchestrates a breakout using Electro, Harada gets whisked back to post haste where they give him control of hydra/hand to declare war on the ? All these puppets are moving but who’s pulling the strings? Good thing Harada didn’t take the bait! Continued love for Jessica Drew despite knowing what looms over in secret invasion. Not much action in this one.